World 1-Castle is the Castle course of World 1 and the first Castle in Super Mario 3D Land. It is primarily filled with lava and sinking platforms. The level icon is a generic castle. In the first area, Mario must dodge two Draglets and cross a Firebar. A Lava Bubble and a Lava Geyser come out of the lava. In the next area, there is a spinning rock gear, with coins above it, a Lava Bubble and a Star Medal in the center. Ahead is another spinning stone gear with a Firebar in the middle. A platform with a Dry Bones and a rectangular ? Block with a Super Leaf is ahead. Near is a platform that rises from the lava, which Mario uses to reach on the top of a wall. Mario lands on a wire platform with a lava geyser and three Lava Bubbles under it. At this point, Mario finds a corridor and a Hammer Bro. Another wire platform (with another lava geyser under it) connects the corridor to the another area, where the Checkpoint Flag and a Firebar are placed. Near is a castle wall with two Thwomps. After Mario leaves the area, he finds a passage with another Dry Bones. Once in the far right, a fake Bowser appears and Mario notices Toad, who is kept captive in a cell past the fake Bowser. 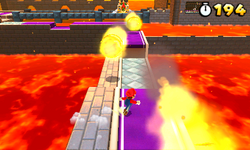 He starts to breathe several fireballs at Mario, while he is running through a path to the boss's bridge. When Mario arrives at the bridge, he must dodge the fake Bowser's attacks and press the button at the end. When the switch is pressed, the bridge breaks and the fake Bowser is revealed to be a Goomba. Once defeated, Mario rescues the kidnapped Toad. After, he can go to a Warp Box that leads Mario to the top of a tower, where the Goal Pole and a green + Clock is found. Star Medal 1: The first Star Medal is in the middle of the first rotating platform, guarded by a Lava Bubble. Star Medal 2: The second Star Medal is near the Firebar after the Checkpoint Flag. Star Medal 3: The third Star Medal is in a narrow space behind the second Thwomp, accessible only by Wall Jumping. This page was last edited on April 5, 2019, at 18:05.